When Should I Feed my Horse a Soaked Feed? Soaked Feeds have been traditionally fed to horses for years and is often turned to as a familiar feed during colder months or when encouraging water intake. But what are the benefits of feeding a soaked feed and how do we know when to use it? Traditionally bran mash would have been fed to horses after intense exercise, to mares after foaling, during colder weather or to senior horses and ponies. Derived from wheat bran, this mash only needs the addition of boiling or near to boiling water before its ready to feed. However, wheat bran has a lower fibre content than first thought, with only 10-12% crude fibre. The use of bran mash began to decrease when owners learnt of the high phosphorus content within this feed. If fed consistently, it could result in skeletal problems, especially when given to young horses. Beet pulp or sugar beet as it is more commonly known, is a by product of the sugar industry and often used in livestock feeds. Sugar beet is a high fibre and high energy source. Often referred to as a “super fibre”, it is an alterative energy source than a high cereal diet and is beneficial in promoting gastrointestinal health and ideal for sensitive horses. Sugar beet can be given in two forms; shreds or nuts, but both require soaking in water prior to feeding. It is important to remember that this convenient fibre source must not be fed in large amounts without soaking as it can lead to colic due to the un-soaked beet expanding within the gastrointestinal tract. Recently, feed manufactures have started to produce fibre mashes. With the quick soaking times and high fibre content these feeds are ideal for all types of horses. The addition of oils and other super fibres can promote weight gain and provide slow release energy sources. 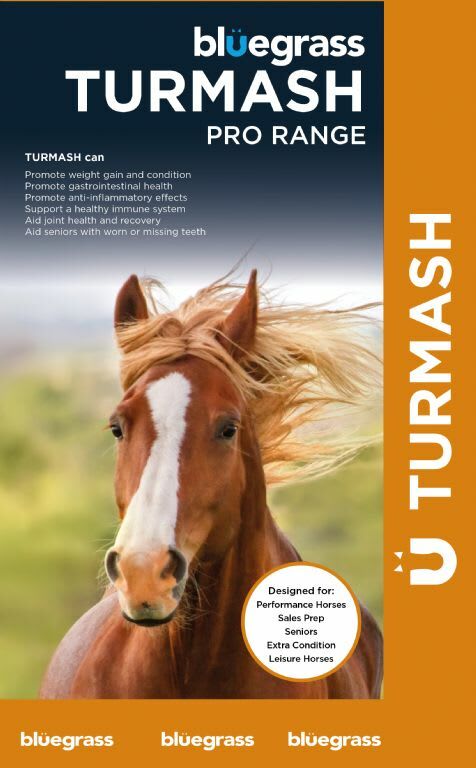 Bluegrass Horse Feeds Turmash is a fully balanced high fibre mash, owners can be assured that if feeding alone or with another concentrate, their horses are receiving adequate vitamins and minerals. So, how can these soaked feeds be useful and when do we feed them? Encourage horses to take electrolytes or other medication, these can be easily disguised in the mash. As the colder months approach and the temperatures begin to drop it can be tempting to give our horses a warm mash to “heat them up”. Unfortunately, this is not as effective as we wish, giving a larger amount of forage encourages more hind gut fermentation which generates heat as a by-product, so instead just give them an extra handful of hay.